Research estimates that women suffer from panic attacks twice as much as men. Among the known causes, the hormonal imbalance during menstruation, pregnancy, and menopause seems to be the most notorious one. Although there is no cure for panic attacks, research has shown that the most optimal treatment for panic attacks combines psychotherapy with medications, and several other supporting strategies can aid the recovery. Continue reading to learn how to effectively treat panic attacks and lessen their impact on your life. Many women report improvements solely from psychotherapy sessions with a licensed psychologist or psychiatrist. Therapy typically takes 10 to 20 weeks, but that might differ depending on the individual needs and the severity of panic attacks. It is the most common therapy to treat panic attacks. During the cognitive part, women are taught to observe their thoughts and identify those that trigger panic attacks. Then they are replaced by more positive, realistic, and constructive thoughts. The behavioral component, on the other hand, focuses on teaching women how to go through a potential panic attack in a more controllable and conscious way. Phytoestrogens, such as soy, flaxseeds, beans, and many more. It might be prescribed in severe cases of panic attacks, especially when they involve phobias, or if psychotherapy did not bring any improvements. They do not cure panic attacks, but they can alleviate their symptoms. Family and friends support is essential in the recovery, as well as the prevention of panic attacks. Women who feel alone with their disorder can also seek help in the support groups, either in their local communities or online. Feeling that you are not the only one suffering from panic attacks can help you re-build your confidence and re-gain control over your life. Certain lifestyle habits can make women more susceptible to panic attacks. For example, a poor diet full of processed food and deprived of healthy fats, proteins, Omega-3 fatty acids, and essential vitamins B or C can weaken your immunity and nervous system. Insufficient sleep, sedentary life, and high intakes of caffeine, alcohol, or illegal drugs, can also trigger panic attacks. Untreated panic attacks can lead to the development of phobias, which can further impair your normal functioning and social interactions. 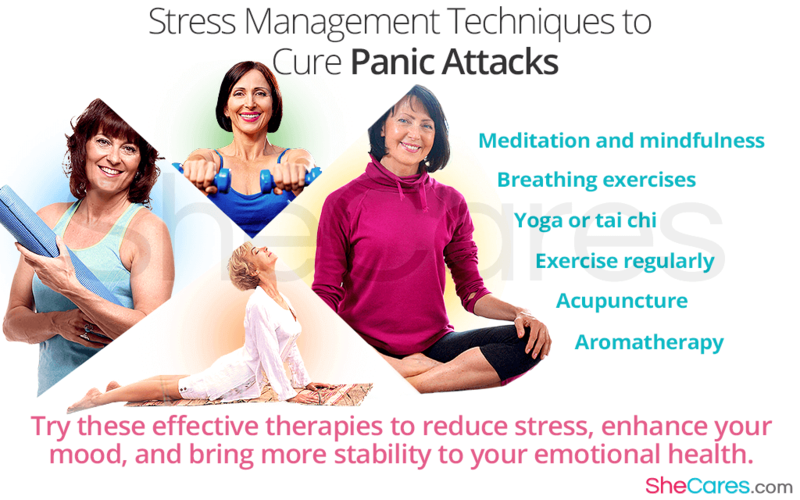 Treatments for panic attacks takes time and patience, but they can greatly reduce the occurrence of panic attacks and significantly improve the quality of your life.